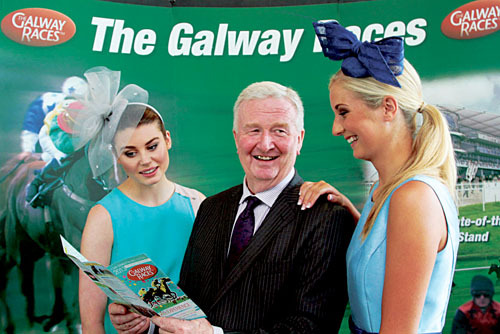 One of the sporting and social highlights of the Irish summer - the 2013 Galway Races Summer Festival - will attract 150,000 punters from Monday July 29 to Sunday August 4 — the launch was told on Tuesday at the newly refurbished Panoramic Restaurant and Corrib Bar at Galway Racecourse. “Over 150,000 racing fans are set to attend one of the biggest racing festivals in the world. We are proud to announce that all 52 races over the seven days of the festival will have a sponsor and the total prize fund will exceed €1.6 million, which is quite an achievement in these challenging times. I would like to express a sincere thank you to all our sponsors for their valued support. We are also delighted to announce an upgrade to the racecourse facilities and this year our patrons will be greeted by a new entrance building to ensure comfort on arrival and they can enjoy amazing views and comfort from the newly refurbished Corrib Bar and Panoramic Restaurant” said newly elected Galway Races chairman Terry Cunningham. Galway also hosts the richest National Hunt race to be staged in Ireland the €260,000 ‘Galway Guinness Hurdle Handicap’ on Thursday, August 1 and Irish Champion trainer Willie Mullins’ preparations are well under way. “We are looking forward to another great festival and the prize money on offer is fantastic. I aim to have a couple of runners in both the Galway Hurdle and the Galway Plate. Away We Go - who was second in The Irish National - is on course to run in the Plate. He likes good ground and this race has been the plan for him since Fairyhouse. Security Breach is progressing nicely and he won well recently at Gowran Park and we’ll aim him at the Galway Hurdle. We’ll finalise the remainder of our team a bit closer to the festival” said Mr Mullins. Europe’s longest running racing festival gets underw ay on Monday July 29 with ‘Galway’s Best Hotel’s’ Race Day, where the feature race will be sponsored by the newly named Connacht Hotel. Other premier Galway hotels including the Radisson Blu, Galway Bay Hotel, Claregalway Hotel, Clayton Hotel, Galway Oyster Hotel and the Pillo Hotel will once again come together to sponsor the opening day of racing. The first race goes to post at 5.10pm (note later starting time ). Galway milliner Suzie Mahoney will also go in search of the Most Appropriately Dressed Lady. Well-known Irish sports stars from the world of GAA, rugby, soccer, and racing will take to the stage on Monday evening and they will be interviewed by one of Ireland’s leading sports presenters. Pat Smullen, who has been leading flat rider at the festival since 2006 said “It is a very important week and there is a lot of pressure involved. Dermot Weld has an incredible record in Galway and people expect his horses to perform well, so from that perspective it is a vital seven days for us. However, it is a week that we always look forward to. It has been a very lucky track for me. The ground staff always prepare the track beautifully and the prize money on offer is excellent. I really enjoy the festival and you always get a great reception down in Galway”. by Galway city's prime entertainment sector. Racing gets underway at 5.10pm. The €200,000 thetote.com Galway Plate features on Wednesday July 31 and all races on this day are generously sponsored by Tote Ireland. “As always, this historic race will be one of the highlights of the week and we have received enquiries from Irish and UK trainers who are about to make entries for this race, which promises to be a wonderful spectacle” said Galway Racecourse Manager, John Moloney. First Race on Plate Day goes to post at 3pm. Guinness continues its sponsorship on Thursday August 1 and Friday August 2 and as already stated sponsor the richest national hunt race staged in Ireland “The Guinness Galway Hurdle Handicap,” valued at €260,000. Racing on Thursday starts at 1.50pm. The ever-popular Ladies Day is an absolute must for fashionistas on Thursday as sponsor Anthony Ryan’s Galway introduces a new Wear Irish award in addition to the Best Dressed Lady and Best Hat Competition. TV presenter and VIP Style Award’s Most Stylish Woman Kathryn Thomas, joins the judging panel, alongside Fashion editor of the Irish Independent Bairbre Power and Editor of Social & Personal magazine PJ Gibbons. With a prize fund of €20,000 it’s the premier fashion event on the Irish racing calendar. Friday patrons will be delighted with our new innovation of Friday Fair Lady Competition sponsored by Athlone Towncentre Shopping Centre. Leading stylist Marietta Doran will select Galway’s Friday Fair Lady who will win a Shop and Stay Package at the Athlone Towncentre Shopping Centre worth €1,000. Racing starts at 5.10pm. Saturday August 3 sees sponsor Ladbrokes continues its Red theme, and in conjunction with fashion house LK Bennett there is a fantastic prize for the best dressed with a hint of red. Award winning fashion designer Heidi Higgins will join Ladbrokes on the day to judge this competition. Ladbrokes will soon be announcing an exciting venture that will benefit a great cause and encourage Galway racegoers to get involved. Racing starts from 2.30pm and the main race of the day is the Ladbroke’s Handicap Hurdle valued at €50,000. in Galway - Galway Shopping Centre, Trappers Inn, Easyfix and Vision Express. Sunday is Family Day and also Mad Hatters Day, patrons young and old are invited to don a mad hat to be in with a chance to win fabulous prizes which will be judged by Galway milliner Edel Ramberg. The top prize on the day is a trip to Milan, while the winning prize for the children’s Mad Hatter is a trip to Barcelona, sponsored by Ireland West Airport Knock. Children and teenagers under 16 years of age when accompanied by their parent(s ) will be admitted free of charge to the Summer Festival Meeting. Any child or teenager who is unaccompanied by his/her parent(s )will have to pay the student admission fee for that day. The shuttle bus service will operate again this year from Eyre Square, drop off at the racecourse this year will be adjacent to Entrance C. This will provide easier access to people travelling to the races by Bus Eireann shuttle. There will be a race card draw each day of the festival for a €500 cash prize. Be part of the adrenalin-pumping action, heart-stopping finishes and breath-taking fashion from Monday July 29 to Sunday August 4 2013. Page generated in 0.2226 seconds.